It's probably just a coincidence. One day after a Russian official warned that Venezuela would struggle to meet its financial obligations to Moscow under a $3.15 billion debt-rescheduling deal, Bloomberg is reporting that a mysterious Russian Boeing 777 had landed in Caracas on Tuesday and ferried away 20 tonnes of gold - equivalent to roughly 20% of the country's holdings of the shiny metal - to an unknown location with little explanation. The story cited a "bombshell tweet" sent by Venezuelan lawmaker Jose Guerra, a "former central bank economist who remains in touch with old colleagues there", and the "welter of social media speculation" that followed (though Guerra provided no evidence). To be sure, many outlandish claims have been made in the week since opposition leader Juan Guaido declared himself the legitimate democratically-elected leader of what was once Latin America's wealthiest nation - creating the biggest threat to Venezuelan President Nicolas Maduro's rule since the socialist dictator took office in 2013. 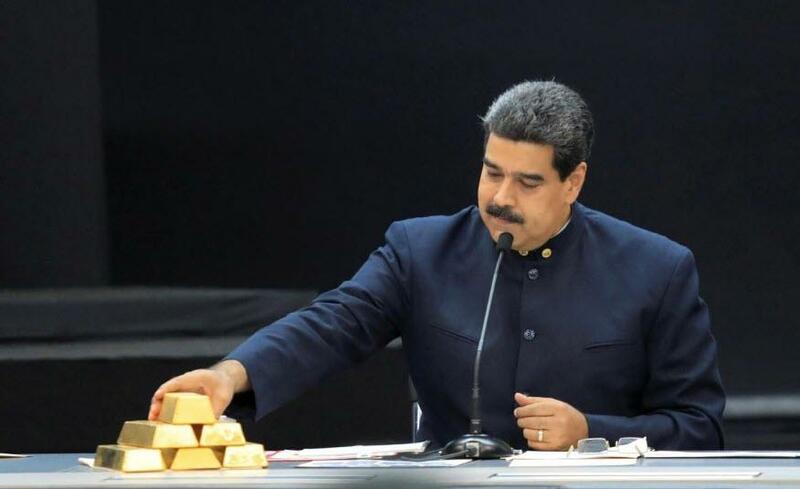 Moving the 20 tonnes of gold bars, worth some $840 million, occurred shortly after the UK denied the Maduro regime's request to retrieve some $1.2 billion in gold being kept in the vaults of the Bank of England. And with the country owing billions of dollars to Russia and China (not to mention Venezuela's long-suffering bondholders), the story's implication is clear: was this collateral paid to Russian President Vladimir Putin? On Monday, a plane belonging to Nordwind Airlines, a popular Russian charter operator based in Moscow, landed at the international airport near Caracas, according to flight tracking website FlightRadar24. A Nordwind spokesman declined to comment Wednesday on the purpose of the flight. While Finance Minister Simon Zerpa declined to comment on the nation’s gold, he said there was no Russian plane at Simon Bolivar International Airport: "I’m going to start bringing Russian and Turkish airplanes every week so everybody gets scared," he said.